Happy Birthday Mark Twain! Born November 30, 1835. 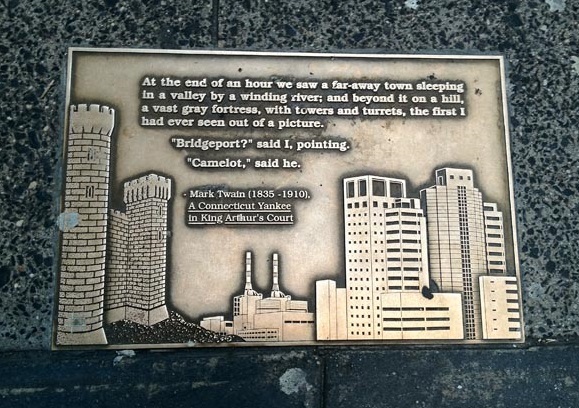 A Connecticut Yankee in King Arthur's Court is arguably Mark Twain's most famous work after those two boys named Tom and Huck. First conceived within a dream in 1884 and published in 1889, Twain's novel is a time travel romp from 19th century New England to the 5th century court of King Arthur. Described as "an object-lesson in democracy" by critic William Dean Howells, A Connecticut Yankee in King Arthur's Court showed Twain's disillusionment with modern political and social life by setting them 1200 years earlier through the experiences of Connecticut Yankee Hank Morgan. The book borrows heavily from Sir Thomas Malory's collection of Arthurian legends — Le Morte d'Arthur. It's well-known plotline has since been praised and parodied ever since. From Bing Crosby to Bugs Bunny. Mark Twain's quote as it appears on Library Way was also quoted by Carl Sagan in his 1985 novel, Contact, and used as a, "metaphor for contact between civilizations at very different levels of technological and ethical advancement." Whether it be a birthday (Happy Birthday Mark Twain! ), anniversary or publication date of a seminal work, the Bar None Group will revisit these 40+ quotations from time to time — quotations that inspire one to write, read, explore and embrace literature. We last visited Pablo Picasso.